We did an interview with Rory from The Daily Coin, last week, and we mentioned how crypto currencies could be problematic for gold and silver. Their existence could replace the massive fiat debt and preclude any reason for gold and silver to rally. You can find the interview here. There has been a lot of discussion of a possible reset whereby gold and silver would eventually replace the failing fiats, and that potential scenario was how $10,000/oz gold and $400/oz silver came about, for the most part. The pertinent question is, which country would want to have a gold and silver backed currency which would severely restrict the ability to issue increased amounts of the currency? Also, every other nation would want to buy and take delivery of any and all available gold and silver. That would not fly, at all. Recall how Nixon closed the gold window back in the 1970s. Plus, how would any government keep control over its people without the ability to maintain a financial stronghold on the population? Then why are China and Russia acquiring so much gold? Gold will always be a form of sound money, and both countries want gold and silver in order to be at the top of the world order, so their purchases are a form of insurance. Both of those countries support the IMF, and China’s currency os now all digital, so there is not one bit of evidence to suggest the acquisition of gold is to provide a specie-backed Yuan or Ruble. Ain’t going to happen. Crypto currencies are another form of fiat, for they are also intrinsically without any value, and all governments can, and will, keep total control over their population through this recent digital phenomenon. That being the case, and it is not a hard one to make, who needs gold and silver? It is quite possible this line of reasoning is why both metals remain mired at current depressed levels despite a huge appetite for acquiring the physical. This is something worth considering. Look what happened to Bitcoin, going to a high of $20,000, at one point, while gold and silver continue to languish. Sure, Bitcoin has since dropped back to the $6,000 level, but even that has been a better performance relative to gold and silver. Two of the most undervalued markets around the world are gold and silver. From the BIS, the central bank for all other central banks, and all central banks under the control of the BIS, they have ensured that gold and silver remain suppressed, considered a “useless relic,” despite the fact that central banks have always accumulated and held gold. 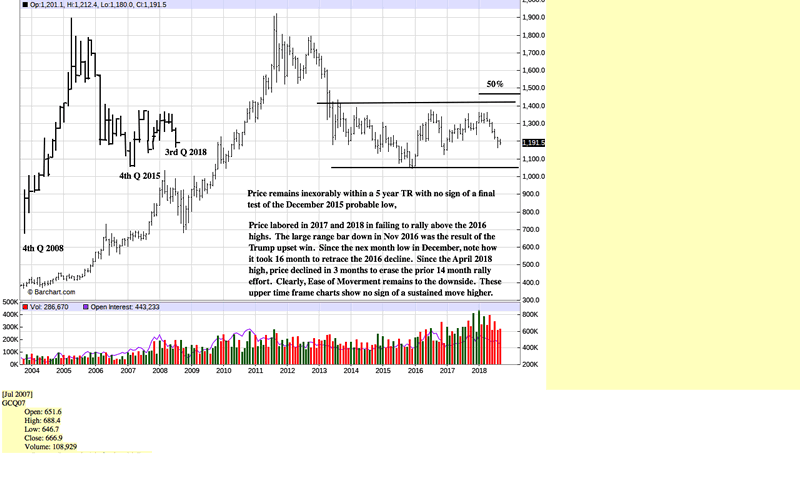 Five years into the long-term TRs [Trading Ranges] for the precious metals does not offer reason to expect a change in trend any time soon. There are myriad reasons put forth by market analysts who specialize in gold and silver, but their opinions have been consistently wrong for their calls of a huge change in trend about to get under way. The market is always the final arbiter for price and trend direction, and the best way to understand the market[s] is through price and volume behavior as found in the charts. Longer term time frames prevail over shorter term time frames. Most people who watch the markets typically us the daily chart to read the markets. The daily charts do not tell the overall character and prevailing trends. Few use annual and quarterly charts. We watch them regularly. Apologies for not being able to show larger chart sizes. One will have to enlarge them as best possible. While we state there is no sign of a final confirmation of the Nov/Dec 2015 low, the current 5 year TR is holding above that low, and within that TR, there have been two higher lows. What is missing are at least two higher highs. EDM, [Ease of Downward Movement] remains to the downside as almost every rally has been more labored and taking much more time. Price is still well under a 50% retracement from all time highs to recent lows, and that is an indiction of a bear market environment. Neither the Quarterly nor the Monthly chart shows any sign of an impending turnaround. The first indications of a change in trend always comes from the lower time frames, first the daily, then the weekly. We connected the swing highs and lows to give a clearer read of the market’s direction. While still bound within an overall TR, there have been 2 higher lows, but the 2016 highs repelled rally highs in 2017 and again in 2018. Until there is a series of higher highs, not much can be expected in terms of a sustainable uptrend. Since the mid-August lows, there have been several high volume selling days in gold, yet the August low did not come under threat of a lower low. We see this as likely short-covering and not new buying because the market is still very weak, and the trend remains sideways within a downtrend. On the Quarterly chart, there was a strong rally bar in the 2nd Q of 2016, and it has held price within that range. We pointed that out as a positive sign back in January, 2018. The low of that bar is now being tested, but that is to be expected to see the whole up bar retraced under weak market conditions. 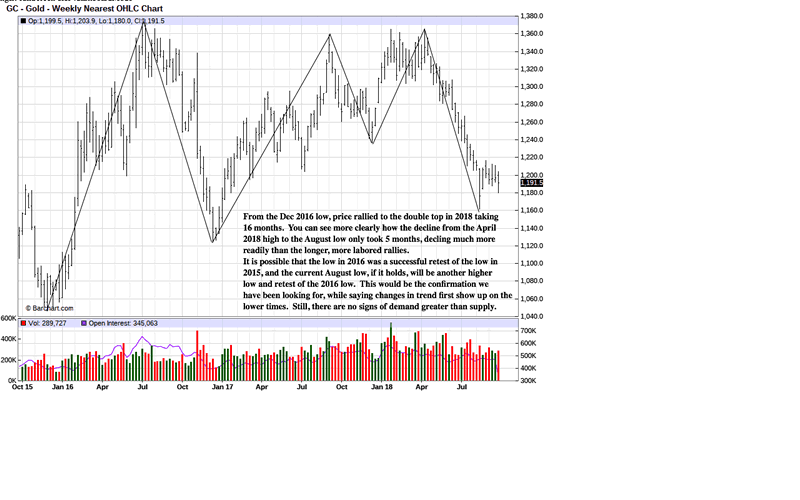 The September low of 13.91 may turn out to be a retest of the December 2015 low in silver, around 13.60. 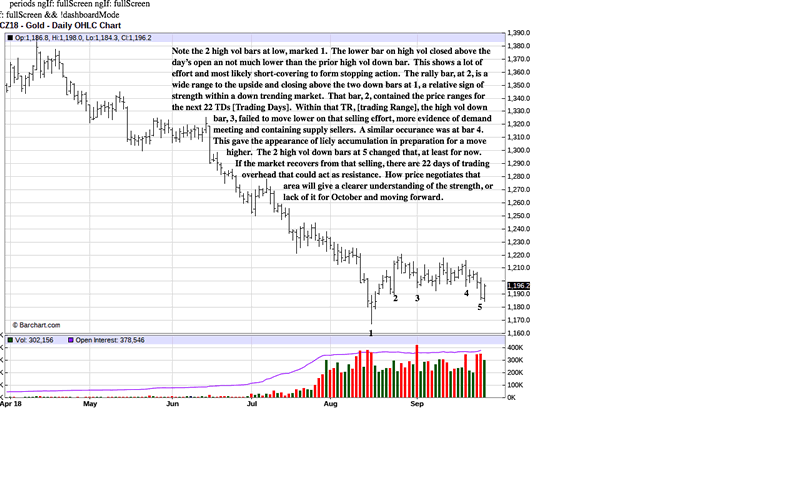 Silver would have to begin to rally higher to make that a confirmation that a low is established. The weekly chart gives more clarity to the 13.91 September low as a possible retest for the December 2015 low. 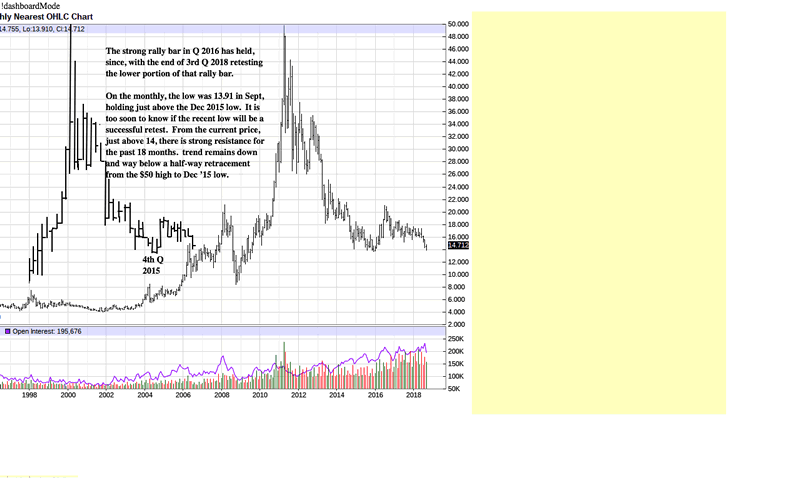 What makes that a more interesting possibility is last week’s rally in silver in contrast to greater weakness in gold. 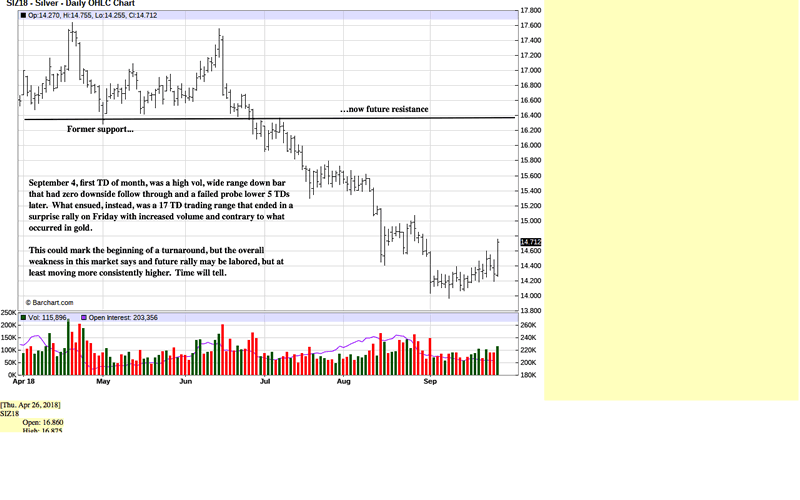 September 4th was a wide range down bar on sharply higher volume, typical of strong selling activity. Yet, price did not go lower, save for a minor failed probe under the September 4 low 5 TDs later. 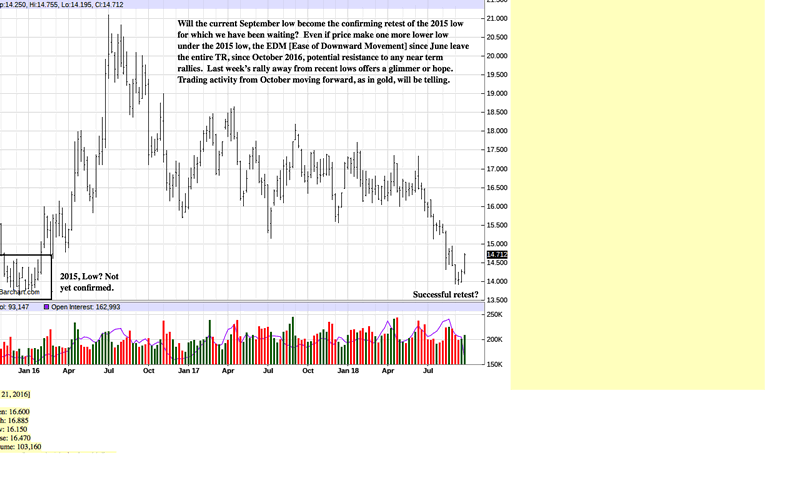 What happened, instead, was silver traded sideways for the next 17 TDs, culminating in Friday’s robust rally to 14.70. While these are positive signs, they do not carry much weight due to the very weak market conditions and weak chart structure. Changes in trend show up on the daily before the higher time frames. These described events may lead to change, but so far, not even the daily chart has turned positive, yet. More patience is required. If we are right about the crypto currencies, one’s patience will be tested as never thought of before. It is a waiting game, right now. Michael Noonan, mn@edgetraderplus.com, is a Chicago-based trader with over 30 years in the business. His sole approach to analysis is derived from developing market pattern behavior, found in the form of Price, Volume, and Time, and it is generated from the best source possible, the market itself. © 2018 Copyright Michael Noonan - All Rights Reserved Disclaimer: The above is a matter of opinion provided for general information purposes only and is not intended as investment advice. Information and analysis above are derived from sources and utilising methods believed to be reliable, but we cannot accept responsibility for any losses you may incur as a result of this analysis. Individuals should consult with their personal financial advisors.